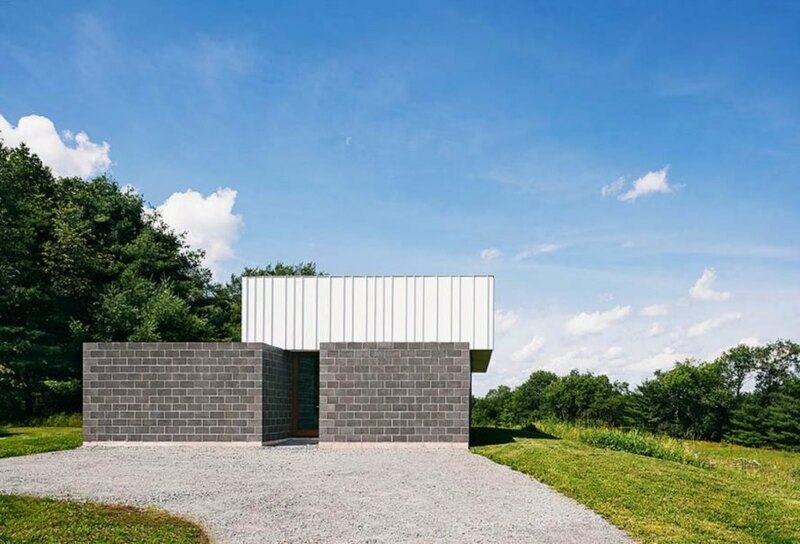 Brutalist-inspired architecture is usually not the first thing that comes to mind when imagining cozy countryside cabins, but two daring designers have created a 900-square-foot house — made primarily of concrete blocks — in the Catskills. The homeowners, architect Jason Shannon and designer Paola Yañez of J_spy Architecture, created the contemporary home with a cluster of three cubic volumes and a white metal box for the roof. The result is a high-end, modern and eco-friendly retreat that sits on six acres of beautiful grassy landscape. The house was designed to be a serene getaway, a place to escape the city and return to nature. 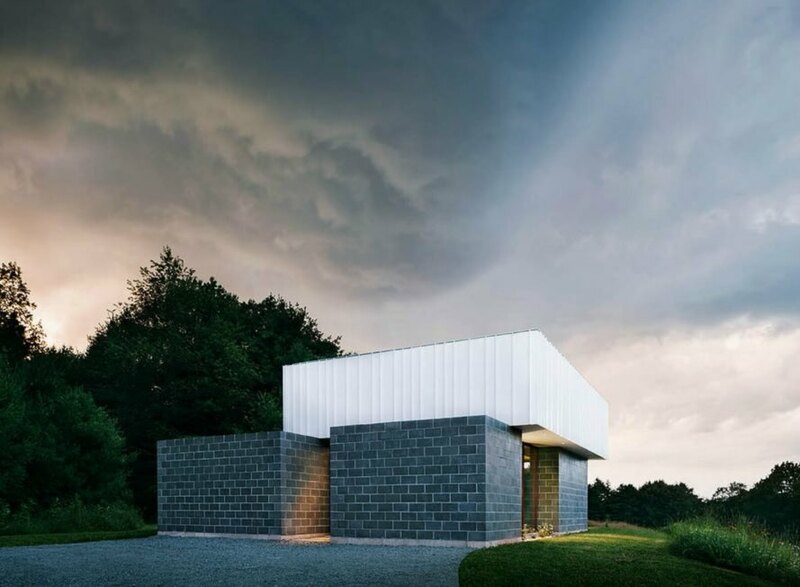 While many people choose to “nestle” their country homes into natural surroundings, this design stands out among the expansive fields thanks to its modern, bold aesthetic. The three cubist volumes made of concrete blocks and large white top floor create a fun juxtaposition to the flourishing, organic background. The interior of the home is contemporary with a welcoming feel. Large windows and doors framed in mahogany provide an abundance of natural light and stunning views. Although the concrete walls were left unfinished on the exterior, the interior blocks feature a polished facade. The main living space has a beautiful 14′ ceiling clad in birch plywood that is interlaced with fabric to help absorb noise. With concrete as the primary building material, the home is extremely energy efficient. 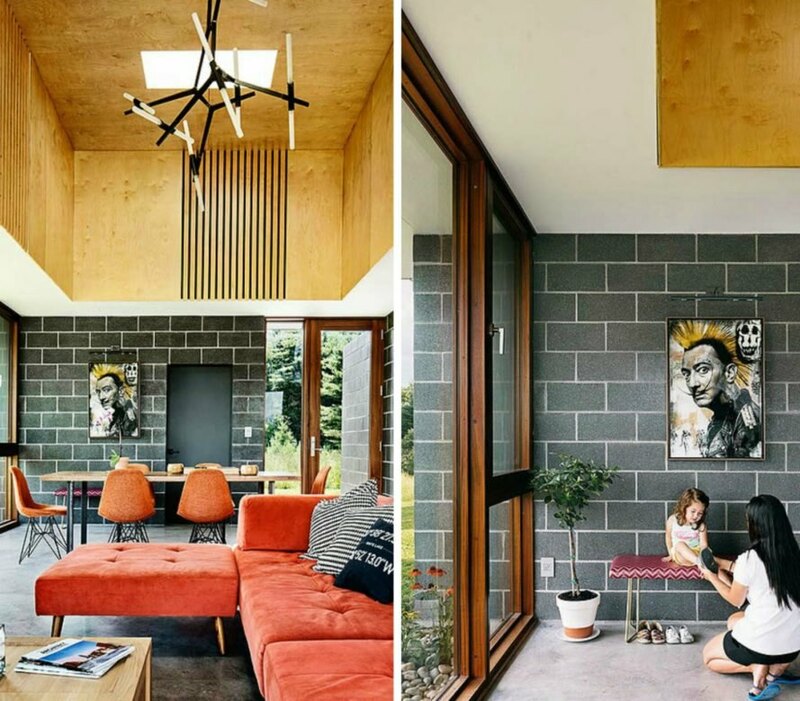 A geothermal heat pump is connected to the home’s concrete radiant floor, which emits both hot and cool air. 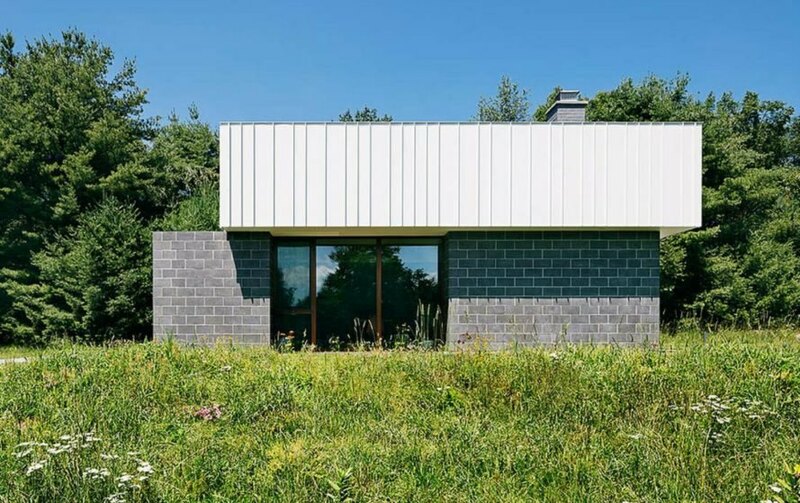 The upper floor, which is clad in white metal, hangs over the dimension of the house for two reasons: to provide passive solar heating and to create high ceilings. In addition to the concrete blocks and radiant heating, the home also has a tankless hot water system and a condenser clothes dryer. To create a tight envelope that reduces energy loss, the house was insulated with a spray foam in the walls and ceilings. Architect Jason Shannon and designer Paola Yañez of J_spy Architecture created a contemporary home with a cluster of three cubic volumes and a white metal box for the roof. The three cubist volumes made of concrete blocks create a fun juxtaposition to the natural surroundings. Brutalist architecture is not normally the first thing that pops into mind when thinking cozy countryside cabins, but these two daring designers have created a 900-square-foot concrete cabin. 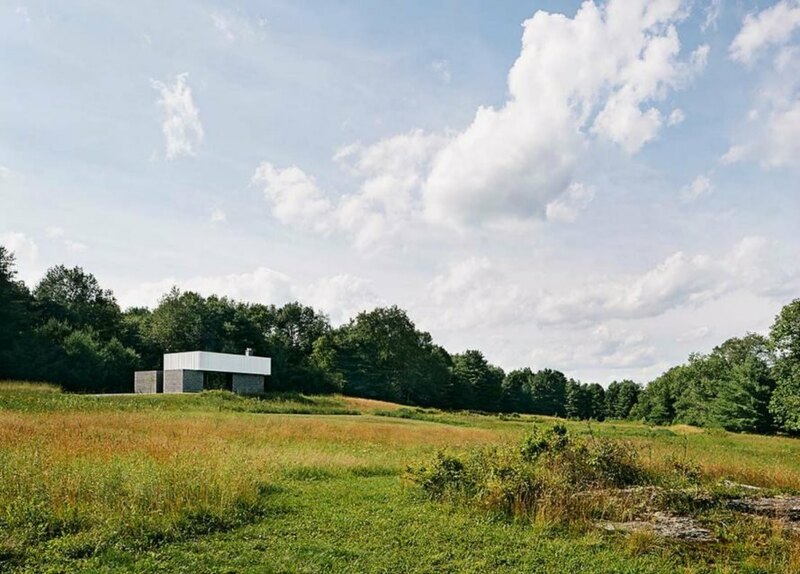 This incredible eco-friendly retreat sits on six acres of beautiful grassy landscape. Large windows and doors framed in mahogany provide plenty of natural light as well as stunning views of the surroundings. The main living space has a beautiful 14' ceiling clad in birch plywood. The home is extremely energy efficient, thanks to the use of concrete as the primary building material. The interior of the home is contemporary, but with a welcoming feel. Although the concrete walls were left unfinished on the exterior, the interior side of the blocks has a polished facade. 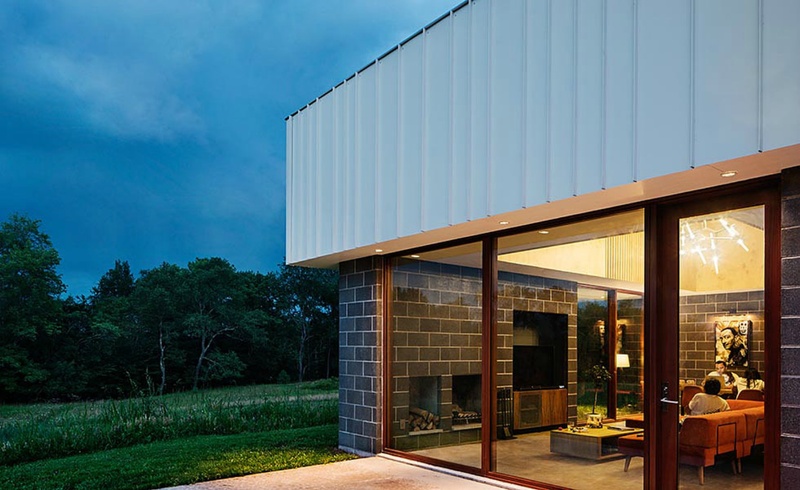 A geothermal heat pump is connected to the home's concrete radiant floor, which emits both hot and cool air. The upper floor was designed to hang over the dimension of the home in order to provide passive solar heating and to create high ceilings. 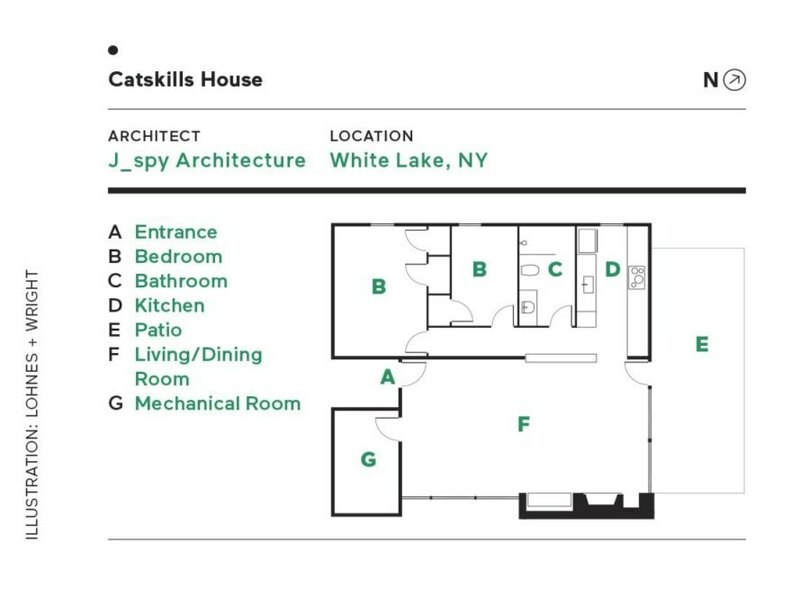 To reduce energy loss, the home was insulated with a spray foam in the walls and ceilings. 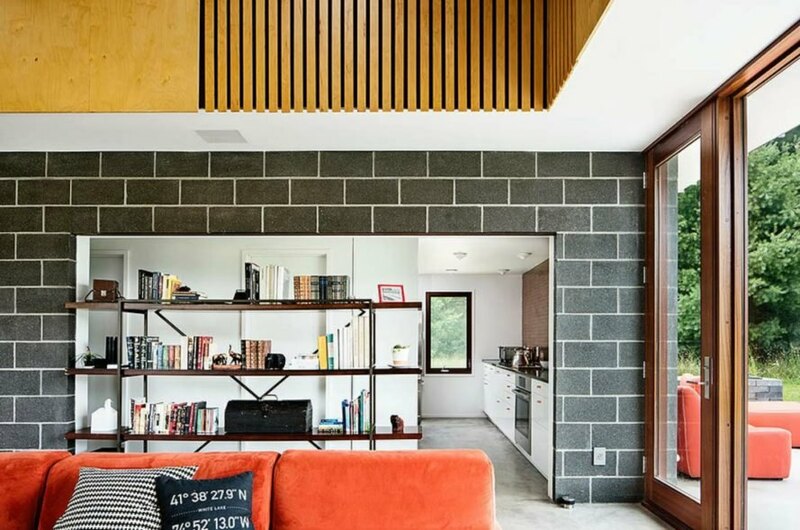 According to the architects, the efficient home is a reflection of how they live their personal lives and their work ethos.